I have always believed we all are born writers, with loads of stories to share. The only difference is some of us listen to them, while some leave them unheard. The listeners always bring those stories out in some form or the other. It is poetry, dance, singing, painting or writing. 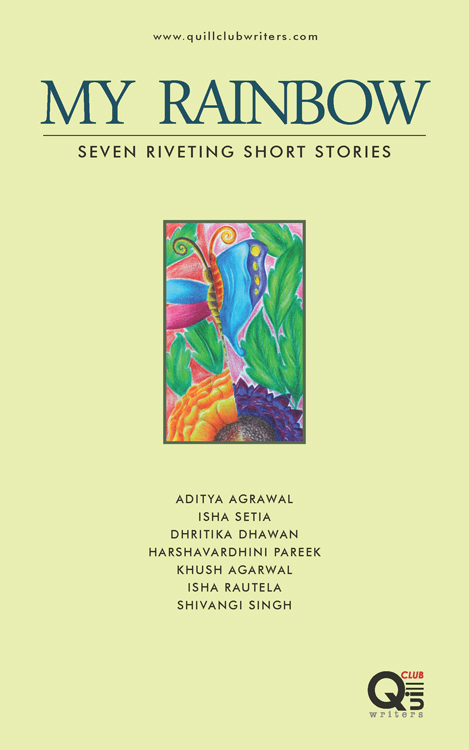 My Rainbow – Seven riveting short stories, is a wonderful collection of short stories none other than students of DPS, Jaipur. And that is perhaps the beauty of this book. The youngest author is not even a teenager while the eldest one is barely 15 years old but the stories narrated by them here have a different tale to say. They seem to soar with their imagination as they carry the reader along with them in a world which is created by them. Here I would like to specially mention Mr. Hemant Kumar, publisher at the Quill Club Writers for not only mentoring the students to bring out the best in them (believe me their best is way ahead than my definition of best). The way he wrote about them and my interaction with him actually led me to read this book for to put it simply – I simply admired him! Thank you so much Sir for “those” lovely words of inspiration, unknown to you they came at a time when I badly needed them!! 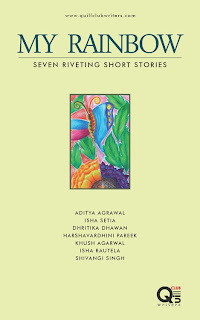 Seven remarkably gifted writers unfurl this first-ever rainbow of unforgettable stories. These lovely students belong to DPS Jaipur and are the future of the Indian Literary world. Just when I thought there was a dearth of good writers, here comes the answer. “We are coming…” they have announced to the world in their own unique way! Honestly speaking when I was first approached to review this book I was a bit skeptical for I did not know how the stories would be, but I would say my interaction with Hemant Sir changed not only the way I looked at this book, but even at my own writing or perhaps writing in general. He made me realize that all this while what I was chasing was a mirage while actually I had already reached my goal long back and I didn’t know that. I was anxiously looking forward to reading this book after that conversation with him. The book’s cover is beautifully done symbolizing elegance and simplicity which added to the eagerness. Starting from the dedication ( It is dedicated to the nation), to the foreword and other introductions this book is definitely different is all that you can feel as you turn page after page. These are the beautiful gems embedded in this book and each one outshines the other. Language, fluidity, narration, story line, characters – everything is impeccable making you forget the age of the authors for a moment.It is difficult to choose one from all of them and say this is the best one for each one of them is class apart. And the wide range of genres covered by them with such beauty it is a pleasure to read such wonderful work coming from such young writers. It is truly a commendable feat to have achieved it at this young age! A highly recommended book for reading to one and all sheerly for the beautiful, heart warming stories which make you wonder at the talent this kids have at this age and then also imagine the ripples they will be creating in the writing world when they grow up. 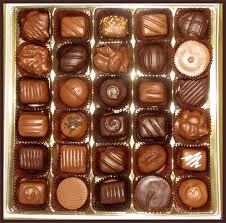 This book is like a box of assorted chocolates. Each one unique in its taste and blend, delicious and yummy! Very young children attempting to write and make it big is very encouraging and sweet. Definitely gonna read this one! Younger than young writers..wow! Oh yes you should.. Am sure you will love it! Oh... ok. I got this info in the introduction in the book... will rectify the same.